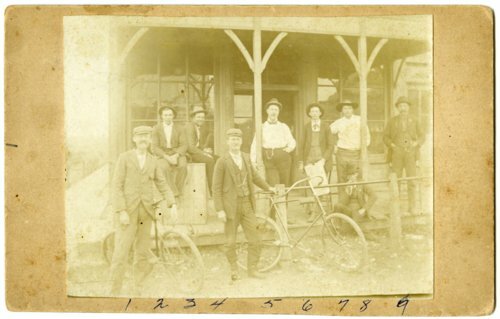 Photograph of nine men standing on the porch of the Bunger Hotel in Alta Vista, Kansas. Writing on the back identifies the man in the center with his arm around the pole as Dr. William Smith. In 1909, the Bunger Hotel advertised room and board for $1.00 per day.